I have been giving a lot of thought to whether I should have bridesmaids in my wedding in Barcelona. Bridesmaids are not popular when it comes to weddings in Spain, so I almost went with the flow and forgot about the idea. I've always known I'll be having bridesmaids in my wedding in Hong Kong because it is a big tradition here. And I am seriously so excited about it, about having my girlfriends sharing my big day with me not as mere guests but as sisters. That's when I thought I couldn't miss the chance to experience this with my best friends since childhood, my best friends back in Spain. Even though we live so far away, they are helping me so much with the wedding planning, and I seriously couldn't do it without them. Soraya is the one who convinced me on having bridesmaids, she practically begged me, and Marta, a wedding-planner herself, gives me precious advise without me even having to ask. Marta also took the responsibility of organizing my bridal shower, which will be in early April, when I go back to Barcelona for some days. 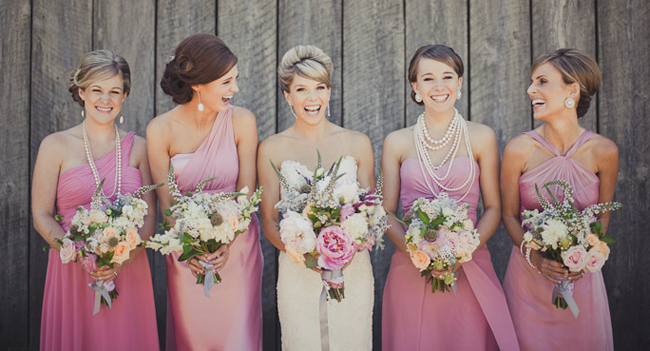 I think bridesmaids make a wedding PRETTIER and MERRIER, and I can't wait to see the result! What are your thoughts on bridesmaids? May this photo mean something?!?!? I'm so glad being you bridemaid! It's a big honour! Thank you so much!!! OMG!!! quina ilu i que guai!!! q contentes que estem totes,oi? serà increible!!! :) mooolt i moooolt happy!! Thanks for following and I've now followed you back. Would you be wearing a traditional Chinese wedding dress? Hi girl! I've just find your blog and it's amazing! love this pictureeeee! Do you want to follow each other via GFC ?